The Lufira Masked Weaver was formally described by Michel Louette, a Belgian ornithologist and author, and by Con W Benson, a British ornithologist. The Lufira Masked Weaver was first collected by Jean-Claude Ruwet, a Belgian zoologist and collector. Ruwet studied the avifauna of Katanga, DRC, and wrote several papers. Ruwet studied the breeding habits of a weaver that he thought was P. melocephalus in the swamps bordering Lake Lufira (now called Lake Shangalele, or Tshangalele). Ruwet recorded several colonies, including one of more than 20 nests. Ruwet collected one specimen at Kinsamba, near the eastern edge of the maximum level of the lake. 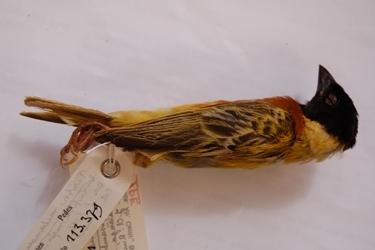 This specimen was a male in almost complete breeding plumage, collected in 1960, probably in the month of March. Verheyen attributed the specimen to the subspecies dimidiatus, while Schouteden 1971a omitted this record from his summary of P. melocephalus specimens. Louette and Benson examined Ruwet's specimen and compared it to other similar species, and realised that it was a new species. 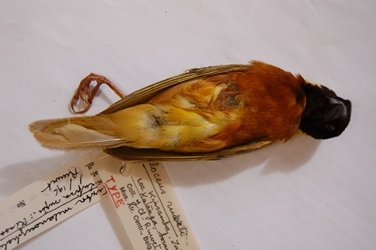 These authors note that the Lufira Masked Weaver differs markedly from other similar weavers in bill shape, and they suspected that its nearest relative is P. reichardi. The Lufira Masked Weaver was first illustrated in the type description, by black and white photos of the type specimen, of a nest, and of a breeding colony. Ploceus ruweti	Louette 1982a,	Bull. Br. Orn. Club 102 p.26,	Kinsamba, Lake Lufira, Zaire. 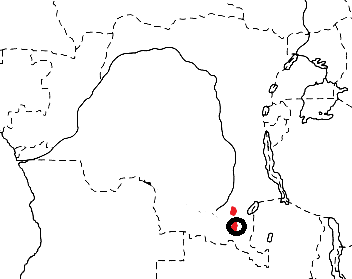 ruweti, Named after J.C. Ruwet (fl. 1965), a Belgian ornithologist. Lufira Masked Weaver (Howard 1984a). Lake Lufira Weaver, Ruwet's Masked-Weaver. The type is in the Tervuren Museum (MRAC_A.113379).